Britain's Alfie Hewett and Gordon Reid came from behind to retain their US Open men's wheelchair doubles title. The pair needed a match tie-break to beat top seeds Stephane Houdet and Nicolas Peifer of France 5-7 6-3 11-9. They played on a virtually deserted Arthur Ashe Stadium as a rain delay meant the match began a couple of hours after the end of the women's final. Earlier, compatriot Andy Lapthorne and American partner David Wagner won the quad doubles title. 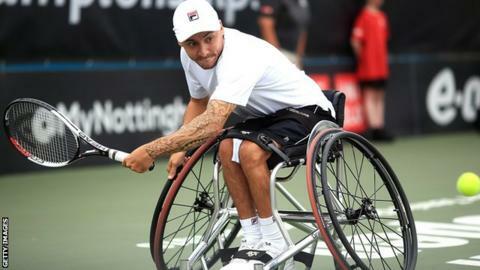 They beat second seeds Dylan Alcott and Bryan Barten 6-3 0-6 10-4. The top seeds won four break points in the opening set before failing to hold serve in the second. But they dominated the match tie-break as Lapthorne successfully defended his 2017 doubles title. The Briton also won the US Open quad singles title in 2014. Earlier in the day, Lapthorne lost 6-4 6-2 to top seed Wagner in the singles competition as his partner went on to win the title.